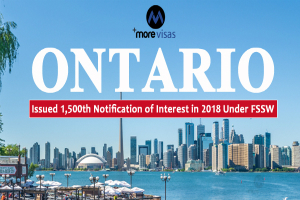 Ontario Issued Ontario immigration announced its 1,500th NOI in 2018 below stream of the French Speaking Skilled Worker in the recent draw of Ontario Immigrant Nominee Program. The Nov 22 draw observed 43 F.S.S.W invites announced, bringing the result for 2018 to 1,519. To pass for the recent draw, mandatory for applicants to present their Express Entry profiles within Jan 1 and Nov 22, 2018. There are no least points demand for the stream. Applicants need to have a minimum of C.L.B 6 in the English language and 7 in the French language to qualify. Ontario currently declared that it had touched its nomination allocation to applicants number 6,600 for 2018. Applicants now being declared with NOI will be called below the 2019 year allocation, if their requests are positive. •	Intention to live in the Ontario Province. Entirely there are 41 F.S.S.W draws in the year 2018. Ontario province has also conducted several Skilled Trades, Entrepreneur Stream and Human Capital Priorities draws in the current year. Since the commencement of August, the major concentration has been on the stream of F.S.S.W, with 17 out of 19 draws focused at French Speaking Immigrants. The two non-FSSW draws were for applicants who are having an employment offer beneath the Human Capital Priorities and by the Skilled Trades stream. Please subscribe to MoreVisas newsletters to update with the latest information about Visa and Immigration. Please take our free evaluation to know whether you are qualified or not and also it will help you to know further options available to you.